The Smart ForFour is a city car that competes with rivals such as the Volkswagen Up and Hyundai i10, but that brings Smart’s usual attributes – namely style, quality and image – to the party. Question is, is that enough? 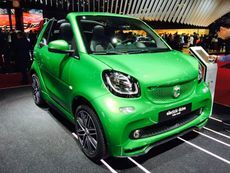 The Smart Fortwo is a two-seat city car that does a variety of things that very few other cars can, thanks to its tiny dimensions and incredible manoeuvrability. It’s great in the city, then, but is it quite so great out of it?